Often touted as among the best destinations in the world for digital nomads, Barcelona not only boasts all the attractions that make it popular with tourists; it’s also an innovation hub full of the things that make digital nomad life easy and fulfilling. 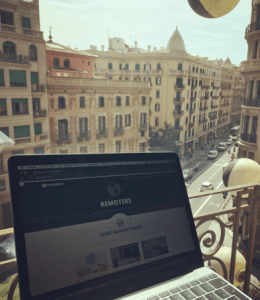 If you’re thinking about coming to Barcelona to live and work remotely, read this guide to get the lowdown on nomad life in this fantastic city. 1. What’s so great about Barcelona for digital nomads? Occupying a worthy place in the top 10 of Nomad List’s best cities to live and work remotely, Barcelona has built a strong reputation as being an attractive and friendly destination for the digital nomad. But why is it that the city scores so highly? The weather is a big plus, for a start. Barcelona enjoys warmth and sunshine for much of the year, with temperatures soaring into the 30s in summer and dipping to lows of around 12 degrees in winter (though even then, it doesn’t rain much). When you want to make the most of this favourable climate, the city has its own 4.5km stretch of Mediterranean coastline, meaning you’re never far from the beach. Then there’s all the other reasons why Barcelona is so popular with tourists. There are heaps of interesting cultural attractions, many centred on the city’s most famous architect, Antoni Gaudi. 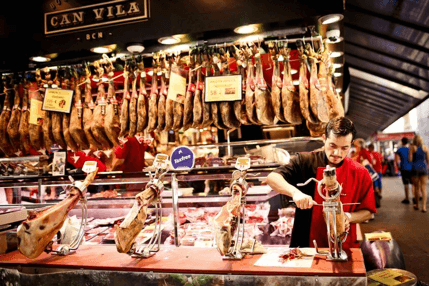 The food is incredible; it’s cheap as long as you stay away from the main tourist areas around the Sagrada Familia and Las Ramblas, and is there anything better than a mouthwatering selection of tapas after a day of work or exploration? From a practical point of view, the cost of living is on the cheap side for Europe, making it an affordable place to live the digital nomad lifestyle. Monthly rent averages around €820 (€450 including bills if you share an apartment), while you can get a great lunch out for around €9 or less, again avoiding the tourist traps. Internet speeds are good, so you’re unlikely to have any issues with running your business remotely from Barcelona. What’s more, it’s easy to get around the city thanks to a comprehensive public transport system that includes the Metro, tram and urban rail network (FGC), and its location is convenient for taking trips further into Spain and across the border into France or Andorra. It’s also a safe place to live (though as with any big city, you’ll need to be on your guard for pickpockets, particularly in the touristy areas). You’ll find plenty of English-speakers in Barcelona courtesy of its large expat community of around 4 million people, including plenty of fellow digital nomads. Indeed, Barcelona actually has the third-highest concentration of freelancers in Europe. Even better, as a European citizen you don’t need a visa to live and work in Spain, and US citizens can stay up to three months without one. The areas known as Poblenou and Sant Marti have a high concentration of your fellow digital nomads; these are the focus for the city’s innovators, with lots of coworking spaces and accelerators, so this is a great place to start looking for somewhere to live. These neighbourhoods also have three parks and five beaches for the days when you fancy working outdoors. If you want to live life like the locals do, trendy Gracia is a great place to set up; tourists don’t venture here too often, and there are plenty of cheap bars if you want to mingle with the locals. Eixample is another good area, and both these areas are within walking distance of the city centre as well as having good public transport links. As a city that’s incredibly popular with tourists, it goes without saying that there are areas of Barcelona best avoided if you want to live affordably. The Gothic Quarter is a particular tourist trap, and that’s reflected in the price of rentals as well as the number of tourists clogging up the streets. It’s also worth noting that the city is clamping down on Airbnb, so it’s getting more difficult to find available rentals on this site. Pisos y Habitaciones de alquiler en Barcelona – a Spanish-language Facebook group with apartments and rooms for rent in Barcelona. Barcelona Rentals – an English-speaking Facebook group listing accommodation to rent in Barcelona. CoWorkation – co-living in the exclusive Sarria neighbourhood of Barcelona, 20 minutes’ walk from the centre, where you can join “like-minded people who work and play together”. If you prefer a proper office environment where you can knuckle down to some work, particularly one where you’ll be surrounded by fellow digital nomads, freelancers and start-ups who you can bounce ideas off, Barcelona has lots to offer. The 22@ area, right by the beach, is known as Barcelona’s Silicon Valley, and it’s where you’ll find the highest concentration of coworking spaces in the city. Here are some links you might find useful when you’re on the lookout for some coworking spaces to work in during your time in Barcelona. Many of these offer monthly payment plans and give you the flexibility to come and go as you please, for as little time as you like. Coworking in Barcelona for digital nomads – our guide to six of the best coworking spaces in Barcelona. Coworkidea – a light, spacious and creative coworking space located between Plaça Catalunya and Universitat. Betahaus – a coworking space that “guarantees a reliable work environment where you can feel safe and comfortable”; you can stay for as little as a week. Coworking centres in Barcelona – a handy directory listing numerous coworking spaces, their prices, contact details and information about each of them. With its thriving expat and entrepreneurial scene, there’s always lots going on for digital nomads in Barcelona, and that means you’ll never be short of networking opportunities. During the lonelier moments of digital nomad life, it’s also reassuring to know that there are lots of others in the city feeling the same way as you – there’s always good company if you need it. Here are just a handful of the networking groups you could join if you want to meet fellow nomads to hang out with while you’re in Barcelona. CODINO – the Community of Digital Nomads in Barcelona (you can also like their Facebook page and join their Meetup group). Barcelona Entrepreneurs & Digital Nomads – Facebook group with 1,600+ members of Barcelona’s digital nomad and online entrepreneur community. Barcelona Digital Nomads – Facebook group with 900 members, where you can meet fellow digital nomads in or planning to be in Barcelona. Barcelona Expats – Facebook group with over 30,000 members – a “community for foreigners and international-minded locals living in Barcelona”. Digital Nomad Meetups – an index of the various Meetup groups you can join in Barcelona. Barcelona Freelancers Meetup – a supportive community offering coworking sessions, lunches and evening events for freelancers, digital nomads and other remote workers. Girl Gone International Barcelona – a Facebook expat group ideal for networking with other women living and working in Barcelona. NORN Barcelona – social events for digital nomads at a beautiful villa in Poble Sec; also has accommodation to rent. Read a review here. Barcinno – an English-language site dedicated to Barcelona’s tech, startup and innovation scene, including news, events and useful resources. TL;DR: Which type of Digital Nomad is Barcelona for?